Mark Stangeland: The North Umpqua Sit In. 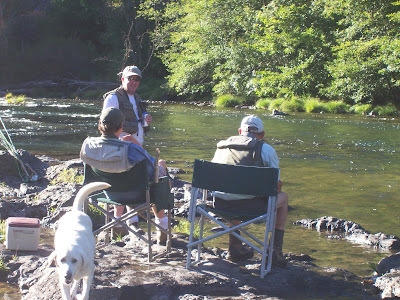 A couple years ago, some guide friends of mine and I staged an informal sit in on one of the most famous runs on all of the North Umpqua fly water,The Station. The Station was the focus of our sit in because there was some issues with how this run was being held at first and last light by a certain unnamed person. The North Umpqua has a unique and storied past. A lot of pools on the river have always been fished a certain way, from a certain side of the river. There is of course a lot of trail side fishing but the majority of all fishing is done from the roadside except the Campwater section.All of the runs in the Camp Water have always been fished from the trail side. That's just the way it is. 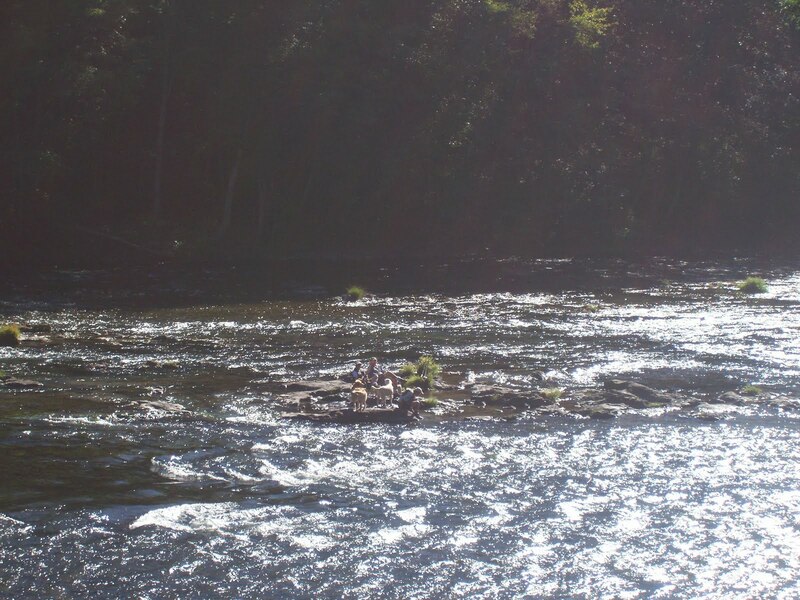 Other places on the river are fished from both the road and trail sides. When you see a car in a spot, you drive on knowing that someone has that area covered. People are very respectful of runs and the person who got there first. Kind of unique in this day and age, but very cool to see. This person started to access and fish runs in the Campwater from the other side(roadside).In over 25 years on the river, I have never seen the Kitchen fished from the roadside like this person was doing. It's just not done. It's about making the cast from the trail side, wading the reef rock,the trail side is THE experience of fishing the Kitchen.This obviously caused friction with many people because you would walk down the trail from the parking lot,to a run like the Station or the Kitchen only to have this person run down from the roadside( with dudes) and snake your pool from you. Not cool. If I knew that was going to happen I would have went somewhere else. That is whats unique about the river. There are very few places that you would ever walk into and find someone else there. The whole car thing is key in knowing where people are and not bothering with that run when you see a car parked there. This person was also doing things like holding runs(Kitchen, and Station especially) an hour or more before evening shade. 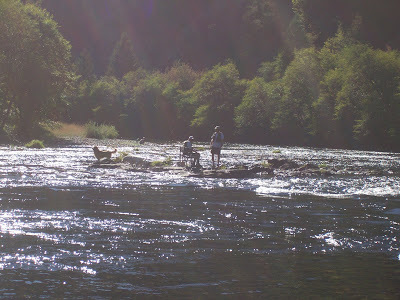 He was also doing some other stuff you just don't do on the North Umpqua.Annoying.It's about timing, if you are there when it shades and no one is in it,it's yours. Standing out there or close to it and waiting for it to shade and pretending like you are tying up a leader for an hour ain't cutting it. Sorry,I digress,on with the sit in story.We waded out to the run with a cooler and some cold refreshing adult beverages. We went out there well before the evening shade session and made our stand(or sit as it were).At one point there was 5-6 of people,4 dogs,10 rods and a few chairs. I don't know if anyone has ever sat out there in a chair ever. It was real nice!The sit in was to make a point to this certain individual who was not playing so nice with others on the river. Lets just say,courtesy to fellow fishermen was not this individuals strong point. The fact that he was a guide and was teaching this type of behavior to his dudes was where we decided to step in.I won't go into all the rest of the reasons why and what this individual was doing because it is not important now. The message was given and the message was received loud and clear and that was our objective. The little demonstration worked wonders and the issues since then have been almost non-existent. We all cared enough about the history and preserving the way things have always been done on the river.We decided to try and make a difference.We let this person know in a over the top way that what he was doing was affecting not just us but many people on the river. He drove by an hour or so into it and he got the point, oh boy did he get it! We all need to be looking out for stuff all the time on our rivers, that includes poachers, other game violations,littering and people just not being good stewards of the resource.As guides we especially need to set a high bar. Guides are the ones who those new to the sport get information, and values from and we ALL need to be above reproach in everything we do on the river. 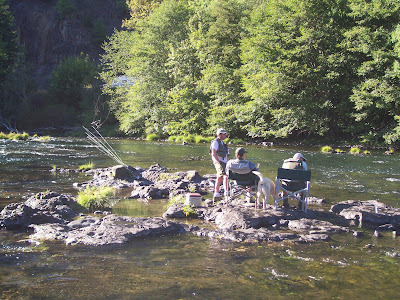 The North Umpqua is built on history, river etiquette and courtesy to fellow fishermen. 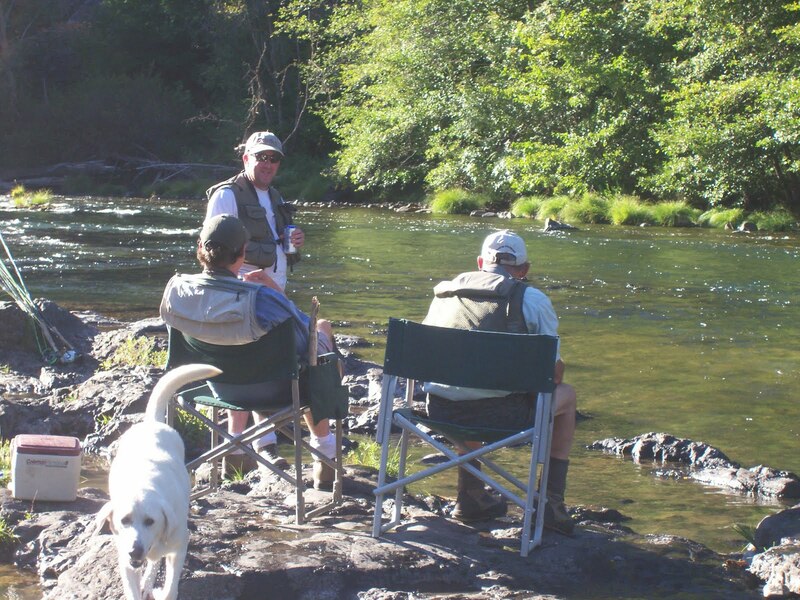 When you feel like something isn't right on the North Umpqua or any river for that matter don't be afraid to talk about it. Communication can go a long way. Some folks that are newer to the river just don't know how things work. 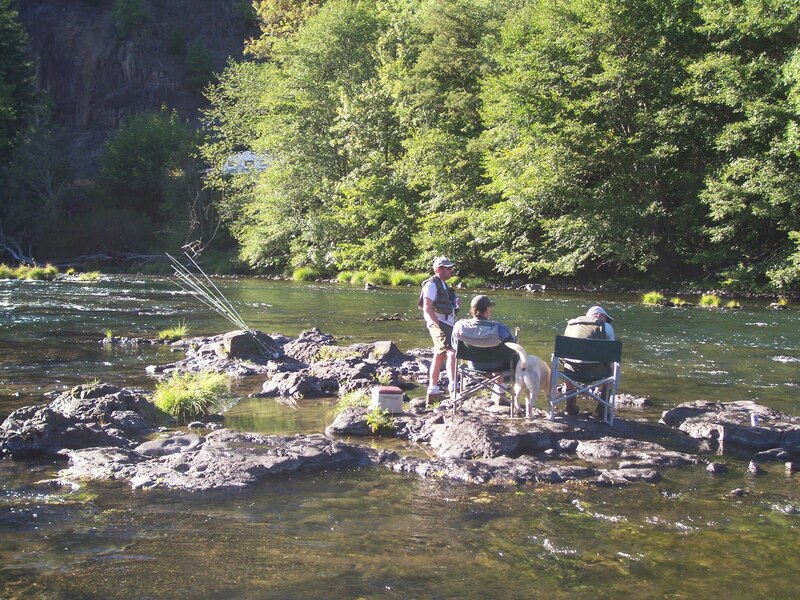 Most people are open to learning about how the pools are fished on the North Umpqua and what methods are acceptable. Having a civil conversation works most of the time. In doing so you are educating folks who may not know better and most probably making some new friends. In the situation we were involved in, talking wasn't going to get it. This person needed to get a visual reminder in a big way to help him see that some of his tactics were just downright dirty pool.Setting up with chairs and a beverage in the station made the point.Enough said.